For many of us, February on the Olympic Peninsula means red wine and chocolate. Folks often believe February in the Pacific Northwest to be a bit dreary. In truth, the second month of the year typically includes many days of grey and rain. Fear not! The antidote to February Glums is the miraculous combination of chocolate and red wines from Washington State. In 2012, the Red Wine and Chocolate Tour will be held from 11 a.m. to 5 p.m. on the weekends of February 11-12 and February 18-20. We are currently exploring bold new combinations guaranteed to rock your world. Take our word for it–you won’t want to miss this event. Mark your calendars now. Tickets are not required to attend the Red Wine and Chocolate Tour, but advance tickets do guarantee admittance. 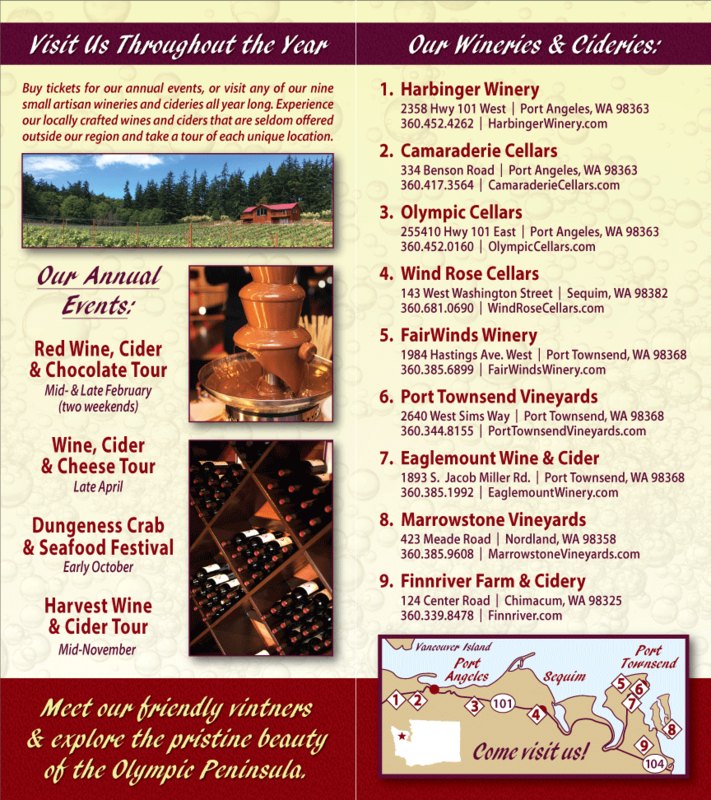 The $30 ticket includes admittance to all eight participating wineries (in Port Angeles, Port Townsend, and Chimacum), a commemorative wine glass, and complimentary wine and chocolate tasting at each winery. If you have your ticket stamped at all participating wineries, you’ll be eligible to win a gift basket. Non-ticketed visitors will be charged a $5.00 wine / chocolate tasting fee at each winery. The Washington State Wineries of the Olympic Peninsula encourage responsible drinking, and we will not serve or sell wine to any guest who appears intoxicated.